Peaceful mind, good health, weight loss, a strong and flexible body, glowing beautiful skin, – whatever you may be looking for, yoga has it on offer. However, very often, yoga is only partially understood as being limited to asanas (yoga poses). As such, its benefits are only perceived to be at the body level and we fail to realize the immense benefits yoga offers in uniting the body, mind and breath. When you are in harmony, the journey through life is calmer, happier and more fulfilling. With all this and much more to offer, the benefits of yoga are felt in a profound yet subtle manner. Here, we look at the top 10 benefits of regular yoga practice. 1. All-round fitness. You are truly healthy when you are not just physically fit but also mentally and emotionally balanced. As Sri Sri Ravi Shankar puts it, “Health is not a mere absence of disease. It is a dynamic expression of life – in terms of how joyful, loving and enthusiastic you are.” This is where yoga helps: postures, prana-yama (breathing techniques) and meditation are a holistic fitness package. 2. Weight loss. What many want! Yoga benefits here too. Sun Salutations and Kapal Bhati pranayama are some ways to help lose weight with yoga. Moreover, with regular practice of yoga, we tend to become more sensitive to the kind of food our body asks for and when. This can also help keep a check on weight. 3. Stress relief. A few minutes of yoga during the day can be a great way to get rid of stress that accumulates daily - in both the body and mind. Yoga postures, pranayama and meditation are effective techniques to release stress. 4. Inner peace. We all love to visit peaceful, serene spots, rich in natural beauty. Little do we realize that peace can be found right within us and we can take a mini-vacation to experience this any time of the day! Benefit from a small holiday every day with yoga and meditation. Yoga is also one of the best ways to calm a disturbed mind. 7. Better relationships. Yoga can even help improve your relationship with your spouse, parents, friends or loved ones! A mind that is relaxed, happy and contented is better able to deal with sensitive relationship matters. Yoga and meditation work on keeping the mind happy and peaceful; benefit from the strengthened special bond you share with people close to you. Spring is here and I cannot wait to share with you cleansing and rejuvenating practices to welcome and align our energy with the blossoming season! What better way than joining me for a retreat? Many people ask me why to choose a yoga retreat as a holiday option? When we commit to take a break from our daily activities and to fully dedicate our time and efforts to self-exploration without external distractions, this is the moment when real and deep changes happen in our bodies and minds. What we discover is that we can actually live our lives being more connected, aware and serene. All it takes is a simple breath in and out. If you are ready to connect with yourself and re-energize your whole-being, join myself and Jordi for our Nourishing Reiki and Yoga Retreat! Time in India was deep and profound. This is one of its kind experiences that I will hold deeply in my heart for the rest of my life. Now my Sadhana (practice) is here, at home. Looking forward to share precious moments with all of you. I’ve often found this time of year to be especially powerful in enhancing my yoga practice. I do believe that yoga is always a powerful practice, however the gift of the new year brings deep reflection and introspection that can amplify processes of self-inquiry, expanding our spiritual awareness and commitment to yogic living. The New Year is a time of transition, when we’re teetering on the verge of new opportunities and possibilities. Simultaneously, we’re experiencing the tail end of 365 days filled with defining, transformative moments, and the imprints of these experiences - be they gains, losses, successes, setbacks - can be most palpable when we reflect upon them this time of year. Luckily, our yoga practice can help us find our footing. Committing to our yoga, meditation, and mindfulness practices can both ground us and open us up to the new possibilities, allowing this time of transition to also be a time of transformation. In class, we commonly practice setting an intention by bringing our attention and awareness to a quality or virtue we wish to cultivate for our practice both on and off of our mat. Like a new year’s resolution, an intention names something we are seeking to attain for ourselves and/or others. But unlike resolutions, intention-setting focuses less on goals and more on the journey which leads to certain outcomes. Think of it this way: intentions focus more on internal power and long-term change, whereas resolutions focus more on external—and sometimes, short-lived—rewards. Intentions seek to address samskaras - i.e. the accumulated residue of past thoughts and actions - from within in order to achieve change. In Patanjali’s Yoga Sutras, it is suggested that samskaras can be eradicated over time by journeying inward and realizing the peace and joy that is our true nature. Not only can intention setting bring about general self-improvement, but can also lead to increasedself-compassion and contentment all at the same time. So remember, if done right, an intention will not only lead us to achieving a check-list of external improvements, it will give us the self-led support we need to realize our true nature. My intention as a teacher is to help each one of you to release tensions and to develop a relaxed state of mind, thus improving mental clarity, alertness and physical well-being. The meaning of the Sanskrit word asana is ‘a steady and comfortable posture’. It is often believed that asanas are physical exercises. And of course this is true; they do have a profound influence on the body, but this does not convey their full significance. Each person is made up of three aspects: body, mind and consciousness, which merge together to constitute our whole being. Asanas aim at influencing all these three aspects and moulding and yoking them into one harmonious whole. As such one should try to think of asanas not as physical poses but as states of being. Correct performance of asanas requires participation of one’s whole being, with awareness of oneself in relation to the physical position and movement, the breath, relaxation of the muscles and so forth. If asanas were only physical exercises then it would be quite acceptable to think about work, breakfast or whatever while performing them. But this is not the case. The practice of asanas requires active involvement of one’s entire being as fully as possible. 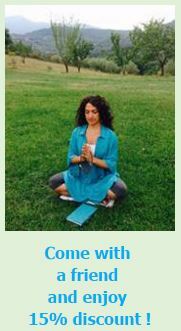 My blog is a free space to share thoughts and opinions on yoga. Feel free to leave your comments!